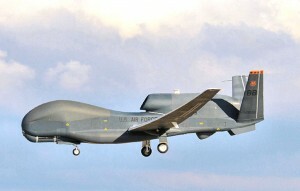 The Defense Department announced that Northrop Grumman has been awarded a $203 million contract to maintain the U.S. Air Force’s fleet of Global Hawk unmanned aircraft. Under the contract, Northrop Grumman will perform planning, operations and maintenance services on Global Hawk aircraft in San Diego through September 30th, 2016. In addition, the company will provide spares, repairs, software, inventory control, engineering and manufacturing services. This new agreement comes shortly after Northrop was previously awarded contract FA8528-15-C-0003 for Global Hawk contractor logistic services and sustainment III, bringing the total amount of money the company will receive for their services to a whopping $3.2 billion.